Prices on solid-state drives are dropping, and operating systems (particularly Windows 7) are beginning to take advantage of the potential higher speeds of SSDs, so it’s a good time to consider slapping one in your computer. Though SSDs tend to be faster overall than hard-disk drives, their speed advantage doesn’t hold across the board. Normally an SSD reads data at a much quicker rate than an HDD does (Intel claims that a typical HDD takes 4000 microseconds to access your data, versus the advertised 65 ms of the company’s 160GB X25-M SSD model); but an SSD’s write speeds may be slower than those of a 5400-rpm HDD. As a result, an SSD is especially good for storing an operating system or applications–and less impressive at handling heavy photo/video editing or media storage, which put a premium on fast write speeds and inexpensive storage (a 1TB SSD currently costs $3000, while a 1TB HDD costs $90 or so). 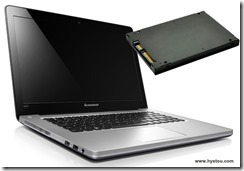 For typical office crunchers or students working with a netbook or laptop, upgrading to an SSD would mean spending less time waiting for the computer to boot up and for data to become accessible. Another significant advantage of SSDs: They tend to be far less battery-intensive than HDDs; in fact, the battery-life difference could be as great as a few hours in some instances.